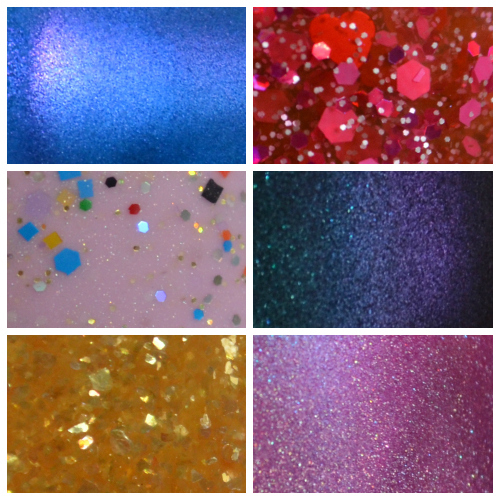 Conjured Polish is back with another awesome collection. The 30th Century Polish collection could loosely be considered a Valentine's collection that was inspired by Futurama. Toe Tappingly Tragic is a blue multi chrome jelly that shifts between blue, green, and purple. The formula was a nice consistency that reached nearly full coverage with three coats. The shift is rather subtle, but definitely noticeable in person. The Flowers, and the Romance, and the Lies Upon Lies is a pink glitter bomb that consists of various shapes and sizes of glitter. The formula and distribution was what I had hoped for. I did not have to fish for hearts, and actually put a few of them back in the bottle. My swatches show one coat over Toe Tappingly Tragic with a second coat on the ring finger. You're Abnormal is a pink holo jelly with a subtle blue shift. The holo really stands out under diffused light, which makes me think it will be extra sparkly in the the sunlight. I used three coats in my swatches. The 30th Century Polish collection is currently available online. There nice. I like You're Abnormal!. It's a double win for sure! The pink is so soft and delicate, pretty swatches!